Debris and downed palm trees were left after Hurricane Irma passed by Fajardo, Puerto Rico, on Wednesday. SAN JUAN, Puerto Rico — Hurricane Irma struck the northeast Caribbean with terrifying force Wednesday, its battering rain and winds of up to 185 miles per hour leaving a trail of chaos, wreckage, and flooding from Barbuda to Puerto Rico, before taking aim at islands farther west and, beyond them, Florida. 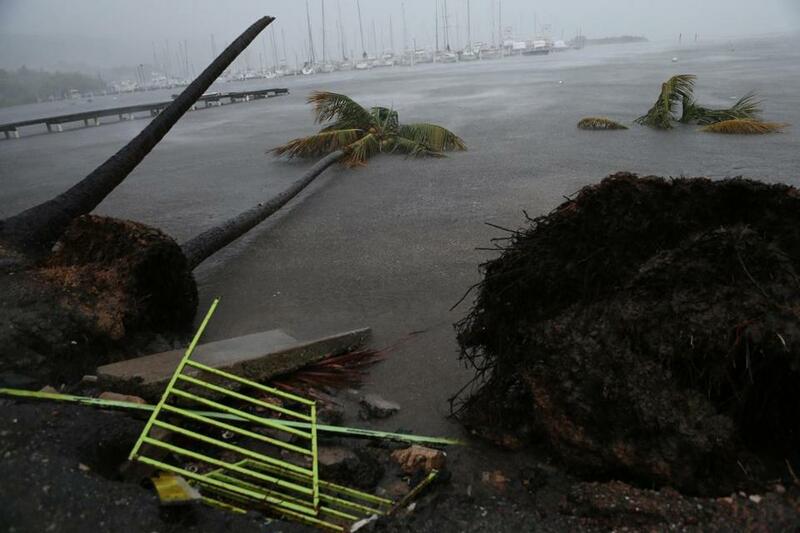 The storm made direct hits on Barbuda, St. Barthélemy, St. Martin, Anguilla, and the British Virgin Islands, and raked the US Virgin Islands and Puerto Rico with hurricane-force wind and torrential rain. Gaston Browne, prime minister of Antigua and Barbuda, said Irma had destroyed 90 percent of the structures on Barbuda, an island with about 1,600 people. ‘‘It is just really a horrendous situation,’’ he told the Associated Press. Authorities confirmed that the hurricane had killed at least one person in Antigua and Barbuda; one on Anguilla, a British possession; and two in French territory, which includes St. Barthélemy and the northern part of St. Martin. Another died in Puerto Rico while preparing for the storm. Irma “will bring life-threatening wind, storm surge and rainfall hazards” to the northern coast of Hispaniola, which includes the Dominican Republic and Haiti, on Thursday, the Hurricane Center warned. It will pass directly over — or very near — the low-lying islands of Turks and Caicos, a British possession, and parts of the Bahamas on Thursday and Friday, the center forecast, and push a storm surge of seawater 15 to 20 feet high. The surge could put large parts of the islands under water. As the storm moved west on Wednesday, it tore up the small islands in its path. Survivors emerged from shelter and posted videos and photos online of the hurricane’s fury: debris flying sideways in near-zero visibility, roofs ripped off structures, waves surging into buildings, downed trees and utility poles, and streets that had turned into raging currents carrying away cars and trucks. The French interior minister, Gérard Collomb, said the four sturdiest buildings on St. Martin had been destroyed. With phone lines and electricity cut in many places, and roads impassable, President Emmanuel Macron of France and other officials said it was far too early to assess the true toll, in either lives or property. The aftermath of the storm will be “harsh and cruel,” Macron said after a crisis meeting at the Interior Ministry in Paris. The devastating winds left many people scrambling for safety. Carmen Caballero, a 69-year-old retired doctor, was unsure at first whether to vacate her two-story home in San Juan, the capital of Puerto Rico. It is made of concrete but has a metal roof that she feared might be ripped away. Then the power went out, the pelting rain and howling wind began, and she could hear debris crashing into things around her house and see tree branches falling into the streets. By Wednesday evening, the center of the storm was about 50 miles north of San Juan, Puerto Rico, and heading west-northwest at 16 miles per hour. Kelsey Nowakowski and some friends boarded up her house on St. Thomas, part of the US Virgin Islands, and hunkered down, listening to the howling and thumping outside. “This is like a movie I never want to see,” he wrote. Throughout the region, communication was spotty at best; calls to people, businesses, and government agencies — even the British Virgin Islands Department of Disaster Management — rang without being answered, or did not ring at all. Irma hit just days after Hurricane Harvey caused record flooding in Texas. With two other storms now reaching hurricane status — José, trailing behind Irma, and Katia, in the Gulf of Mexico — meteorologists noted the unusual occurrence of three hurricanes forming at once in the Atlantic basin. Hurricane Irma’s maximum sustained winds of 185 miles per hour have been matched by only three other Atlantic storms; the last, Hurricane Wilma, was in 2005. By Wednesday afternoon, Irma had kept that wind speed for over 24 hours, the longest period ever recorded. Monroe County, which includes the Florida Keys, issued a mandatory evacuation order on Wednesday. Broward County, which includes Fort Lauderdale, advised people to evacuate some areas. The storm is expected to hit the state Sunday.